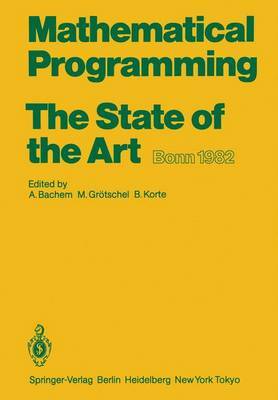 In the late forties, Mathematical Programming became a scientific discipline in its own right. Since then it has experienced a tremendous growth. Beginning with economic and military applications, it is now among the most important fields of applied mathematics with extensive use in engineering, natural sciences, economics, and biological sciences. The lively activity in this area is demonstrated by the fact that as early as 1949 the first "Symposium on Mathe- matical Programming" took place in Chicago. Since then mathematical programmers from all over the world have gath- ered at the intfrnational symposia of the Mathematical Programming Society roughly every three years to present their recent research, to exchange ideas with their colleagues and to learn about the latest developments in their own and related fields. In 1982, the XI. International Symposium on Mathematical Programming was held at the University of Bonn, W. Germany, from August 23 to 27. It was organized by the Institut fUr Okonometrie und Operations Re- search of the University of Bonn in collaboration with the Sonderforschungs- bereich 21 of the Deutsche Forschungsgemeinschaft. This volume constitutes part of the outgrowth of this symposium and docu- ments its scientific activities. Part I of the book contains information about the symposium, welcoming addresses, lists of committees and sponsors and a brief review about the Ful- kerson Prize and the Dantzig Prize which were awarded during the opening ceremony.